China pays great attention to the peace process in Myanmar, and is willing to play a constructive role in this regard for the security and stability in their border areas, Xi said. 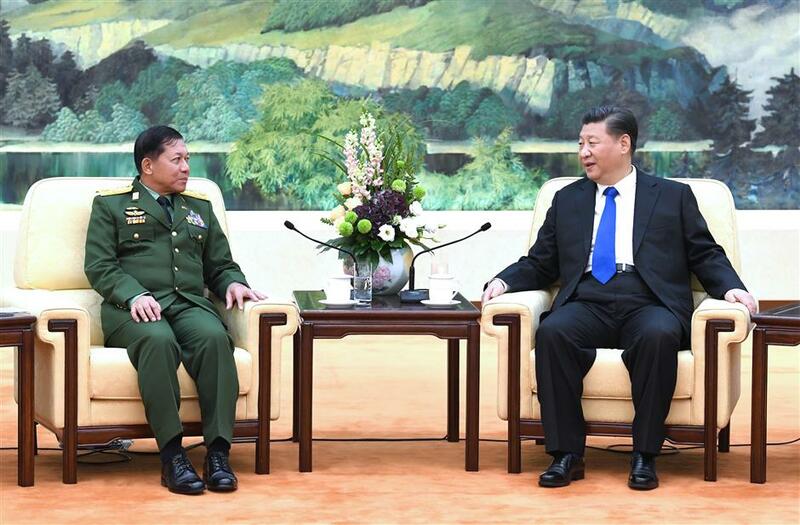 Chinese President Xi Jinping (R) meets with Myanmar's Commander-in-Chief of Defense Services Sen-Gen Min Aung Hlaing in Beijing, capital of China, Nov. 24, 2017. China pays great attention to the peace process in Myanmar, and is willing to play a constructive role in this regard for the security and stability in their border areas, President Xi Jinping said Friday. Xi made the remarks while meeting with Myanmar's Commander-in-Chief of Defense Services Sen-Gen Min Aung Hlaing. Xi, general secretary of the Communist Party of China (CPC) Central Committee, said the 19th CPC National Congress has adopted a blueprint for China's economic and social reform and development for the years to come. "It will not only inject great vitality into China's own development, but also bring new opportunities for various countries, including Myanmar, in their cooperation with China," he said. Hailing the "profound bilateral friendship," Xi called on the two countries to "strengthen strategic communication and accommodate each other's concerns." China always respects Myanmar's sovereignty and territorial integrity, Xi said. Considering China-Myanmar military ties as at their "best" period in history, Xi, also chairman of the Central Military Commission, vowed to support stronger military exchanges and cooperation in various areas. He encouraged the two armed forces to work for the growth of bilateral ties as well as regional peace and stability. Min Aung Hlaing congratulated Xi on his re-election as general secretary of the CPC Central Committee and on the success of the 19th CPC National Congress. Calling the two countries close neighbors, he said Myanmar appreciates China's help for its national construction and military building over the years, as well as support for its peace process. Myanmar expects to actively participate in the Belt and Road Initiative, and cement exchanges and cooperation with China in various fields, he said.